Winter has finally arrived, albeit somewhat benignly as of yet. There is a bit of snow on the ground in places. Fairbanks dog mushers were finally able to park the ATVs and break out their sleds. Decent snow, mostly north of Salcha, is allowing normal winter activities along established trails. Delta Junction has enough snow to soften a four-wheeler ride. A few of the trappers are out with ATVs, pulling snowmobile sleds. Most ponds are solid in the Fairbanks and Delta areas, and all of the Paxson-area lakes are frozen. Recreationalists should use caution, however, as early season ice always has weak areas near inlets and outlets. The Denali Highway received good snow last week, with some areas receiving as much as a foot of heavy snow. The heavy new snow created substantial overflow issues on almost all water bodies. Paxson and Summit lakes have 6 inches of ice, and it is not good ice. 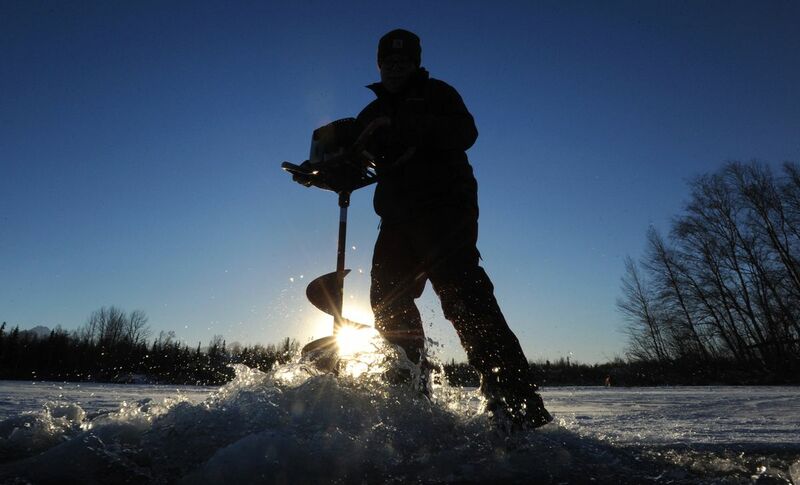 Fishermen or caribou hunters should use extreme caution on all lakes in the area. Caribou are still moving in the Sourdough area, and subsistence hunters are able to achieve decent success near the Richardson Highway. The Denali has enough snow to make it marginal for highway vehicles. If you have a federal caribou permit and are thinking of Tangle Lakes, bring a snowmachine. Tangle Lakes, in particular, are notoriously unsafe early in the season because of numerous springs and inlets throughout the entire system. Despite the need for caution on Denali-area lakes, November is one of the better months to break out the fishing gear. There is still enough daylight, and relatively light snow cover allows decent light through the ice. Thin ice makes for easy access to fish. An ax and a light chisel will trump the ice auger. Lake trout are fairly active in November. Fishing will slow in December other than a decent burst of activity around Christmas. Big trout will move into shallow water for a two-week period in late December as they feed on the winter-spawning humpback whitefish. Large trout can be found 6 to 8 feet deep during this period. Fishing for them can be difficult because shallow-water fish are easily spooked by noise or movement just over their heads. Smaller trout will be found in the 16- to 20-foot range for most of the day. Enterprising anglers might try a foray into the 10- to 12-foot range before noon. Lake trout are not especially active after dark, but as soon as there is enough daylight to see, they move into shallow water to feed on snails. Did you ever wonder, when fishing in a party of friends with four or five holes going at once, why one hole seems to get almost all of the action? Think about the water currents under the ice. The direction of travel for a fish is into the current. A current that we have difficulty discerning will be readily apparent to aquatic life, so spread your fishing holes cross-current. Beyond fish, it is also time to think hunting. Spruce hens are pretty much inedible after mid-October, but sharptails and ptarmigan become easy to find once there is enough snow to spot tracks. It has not been a banner year for grouse. However, there are decent numbers around Isabel Pass and along the Denali Highway. One must also consider next season’s hunting. It’s the season for Tier I, Tier II and drawing permits. The application period for permit hunts opened Nov. 1 and will continue until Dec. 17. There are dozens of drawing hunts scattered throughout the state. Many moose hunts are antlerless hunts, which must be authorized by Fish and Game advisory committees to be valid. Bison hunts are by far the most popular drawing hunts — less than 1 percent of applicants are successful. The 2018 Delta bison hunt yielded $350,000 in application fees from 35,000 hunters who applied for 110 permits. The hunt typically has a 70 percent success rate. The recent snow should help the bison and caribou hunters. Tracking will be easy and there isn’t enough snow to impede travel. Temperatures are still hanging in the mid-October range. All in all, it has been an easy winter for the outdoorsman. The only thing that could put a winter crimp in weekend plans is a frozen septic system caused by low snow cover. John Schandelmeier is a lifelong Alaskan who lives near Paxson with his family. He is a Bristol Bay commercial fisherman and a two-time winner of the Yukon Quest.